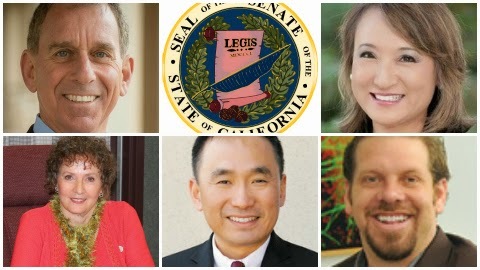 Clockwise from left: Assemblymember Bob Wieckowski, Mary Hayashi, Audie Bock, Peter Kuo and Roman Reed. THE CANDIDATES We all know about Mary Hayashi’s past, but what is missing from this campaign is just how progressive a record she had in the Assembly. During her six years in the lower house, Hayashi was a strong advocate for mental health issues and health care, in general. She did, however, have a reputation for not playing well with others in the Legislature. The residual animosity is one reason why many in government at all levels in East Bay have found it hard to forgive her. But, money talks and her $800,000 war chest to start the campaign is a major hammer, which she has plowed through in recent months. Hayashi’s last campaign finance report two weeks ago showed her with $176,000 in the bank…Assemblymember Bob Wieckowski has burnished an image as an elected official who is quite friendly to labor unions. Nothing wrong with that, but Wieckowski is also a former bankruptcy attorney and his support from trial lawyers got him in trouble during this race after he registered the only vote for an heartbreaking domestic violence bill that ultimately became law in 2012. Wieckowski has also led the way in urging Congress to overturn Citizens United, which U.S. Supreme Court ruled corporations have the same rights as people and the recent decision removing federal limits for campaign donations. Wieckowski made news last year with a bill that would have allowed undocumented immigrants to serve on juries that Gov. Jerry Brown vetoed…Never heard of Peter Kuo? After Tuesday you might hear a lot about him. The lone Republican in the race nearly quit late last year, but a State Senate bill looking to reinstate affirmative action for university applications and state contracts lit a fire in him and an upset the growing Asian American community in the 10th District and beyond. He emigrated from Taiwan as a teenager and the issue of SCA-5 dovetails nicely with his description of the American Dream. Republican Party leaders see potential for Kuo and the district’s large chunk of non-partisan voters…The third Democrat in this race is Roman Reed, a former Chabot College football player who was paralyzed during a game almost 20 years ago. Reed, now a Fremont Planning Commissioner, went on to graduate from Cal and has worked to fund various stem cell research programs around the country, including his own, the Roman Reed Foundation…In a 1999 special election, Audie Bock pulled off one of the biggest shockers in recent East Bay history when she won a seat in State Assembly as a member of the Green Party. Today she is an independent. In recent years, she has run for various seats in the Hayward area and is currently an elected member of the Fairview Fire Protection District. During this race, Bock has been highly-critical of the Russell City Energy Center on the Hayward Shoreline after the power plant was found to be emitting water particulate 10 times higher than allowed. MAIN BEEF Mug Shot Mary vs Bob the Bully. Sort of sounds like a character-driven public service announcement against bad behavior, doesn’t it? This race never got past Hayashi’s 2011 arrest for shoplifting and it only got worse when her campaign fired back. The campaign never came close to a discussion of the issues and that’s a shame since outside of the Fremont portion of the 10th District, much of this area is smarting from ineffective local government and challenged school districts. BY THE NUMBERS Voter Registration: Democratic 50.3%; No Party Preference 24.9%; Republican 16.9%. Campaign Finance: Hayashi $176,062; Wieckowski $70,881; Kuo $50,356; Reed, no report filed; Bock, no report filed. PREDICTED ORDER OF FINISH 1. Wieckowski 2. Kuo 3. Hayashi 4. Reed 5. Bock. ON TO NOVEMBER If Wieckowski can avoid another costly round against Hayashi in November, he will likely walk into the State Senate. Barring a Starkian meltdown of epic proportions it is extremely difficult to envision this district electing a Republican. However, if Kuo, an uber nice guy can contrast himself with Wieckowski in the line of Hayashi’s “Bob the Bully” moniker, he could force Wieckowski to play ball all the way to the finish line. 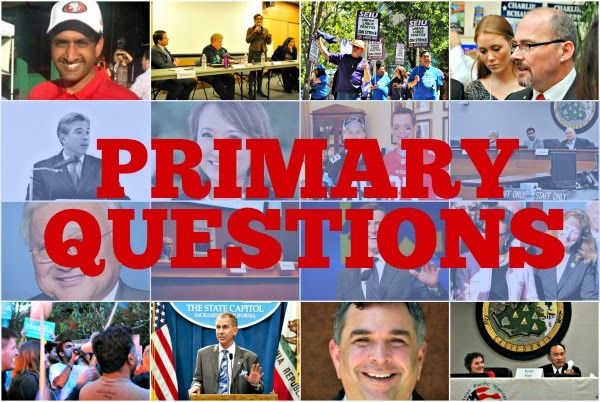 Another question: can the cash-strapped state GOP afford to fund two East Bay upstarts in Kuo and the 16th Assembly District’s Catharine Baker? If they had to choose one or the others, the best bet for winning rests with Baker. However, if Hayashi can live another day, things could get interesting. Does Wieckowski continue to trot out the infamous mug shot and Neiman Marcus surveillance video or change course? Good money says he continues to go negative since his record in the Assembly is without distinction. If I’m Hayashi, I do what I should have done six months ago and bare my soul on television like Nadia Lockyer. Barbara Walters retired, but someone at KGO-TV will do the trick and by all means, cry! Posted in Assembly, Audie Bock, Bob Wieckowski, June primary, Mary Hayashi, mugshot, Peter Kuo, primary questions, Republicans, Roman Reed, State Senate, website. Bookmark the permalink. Mary at $176K on May 17th. Means she will finish the primary with well under $100K. She is finished even if she makes it into the runoff, as her war chest advantage has been squandered with minimal results. You have to wonder how come she failed to learn her lesson in the 2012 supervisorial race. Sure, she had lots more money this time, but we saw how much that helped Meg Whitman. Mary's negatives are more than equal to Whitman's. This race, if it ever was one, was over the day all local TV stations went public with the store video showing Mary shoplifting and being arrested. I mean, come on, even a much loved candidate would struggle with that. But Mary isn't a much loved candidate, not even before her arrest. Feared perhaps, but not loved. Well, at least the consultants, ad agencies, and pollsters did well in the pocket book. Why build up Kuo? I don't see anything particularly impressive about him at all. Sm i missimg something??? Kuo starts with 17% and takes away from Hayashi more than anyone else… Pretty accurate. Crystal clear that Kuo is taking away from Bob. Hear for yourself as violin rendition is beautiful. This piece was written by a famous Taiwanese composer for a dying friend but to be sang by her daughter. This song is about the values of a mother devoting her entire life to her only child, her daughter. Crystal clear that Kuo understands the family devotion. Kuo has no way to win. It's Bob Wieckowski very easily. Let see on June 3rd, dirty Bob wins dirty. I know many people who voted 'anyone but Bob' because of the negative campaigning, so anything is possible. Might be better if Mary barely makes it into the #2 slot. Then, though completely hopeless, she'll have to grind it out in Sept and Oct. running completely out of money and being embarrassed in November. That should finally finish off her political future and influence. No office, no money pot, no nothing. Boy oh boy, has she ever played her position poorly after the arrest. She seems clueless, unable to perceive public opinion. Mary has some things that many politicians lack; an MBA, real job experience outside of politics, an influential husband, some non political financial assets, lots of combativeness, some chits to call in and relative youth. Her big negative is that she is not well liked and unwilling to acknowledge some serious problems. Hope she turns this page in her life quietly and moves on other useful non political activities. But does Mary have an “influential husband”? Rumors abound of a divorce. Steven?? 4:02, didnt George W. Bush have an MBA? We're all voting for BETTY YEE FOR CONTROLLER. HUGE, gay, cholo and dirty union whore John Perez is running against her. What a HUGE stink that guy is! 6:49 Betty Yee would never condone that kind of talk about her opponent, and in fact has a diverse coalition of groups and individuals supporting her, including prominent Latinos like Dolores Huerta. 1:55, what? ALL latinos think the same? How is rhat possible? Does anyone have the time and location of tonight's big GOTV rally for Mary Hayashi? Do we have to eat before, or will there be food served prior to the rally? Is there a central coordinator for the entire senate district or should all volunteers just call the regional leader for their own city? I've heard there are still a few Hayward precincts that aren't yet fully staffed. What do you hear? Everyone here is excited and ready to go go go all day Tuesday. We'll show them! Mary will regroup and run in 2022. She'll only be 55 or 56. Now, if that is her plan, she needs to do a full confession in about 12 months… saying she had a psychological condition… is getting treatment… and will do her best. That followed by 7 years of public service. After all of that she may be accepted as a candidate. That is what she should have done in February of 2012. By now, we might even be thinking she is OK.
Lots of others have been rehabilitated and come back. “GOTV rally for Mary Hayashi” ha! 1:13. A politician” on ice” for eight years? She will be completely forgotten by 2022. Mary belongs in jail. If she wasn't Assembly woman at the time of her crime, that's where she would be! Bob won because he was the best candidate and backed by the unions. He will win again on November 4th with over 60% of the vote.